Breath-taking photos. It was worht the wait, methinks. Thanks. Yeah for spring! On the rhodies I don't think I'd worry too much. Just give it a month or two to see what exactly is damaged (what doesn't leaf out) then trim those spots out. Rhodies are tough and have been around for a long time in Maine in far worse winters. They'll bounce back nicely just like all the rest. Beautiful magnolias! A late but, surely, all the more welcome Spring. The new growth everywhere is such a joy! Here Spring has been and gone and winter has reappeared. 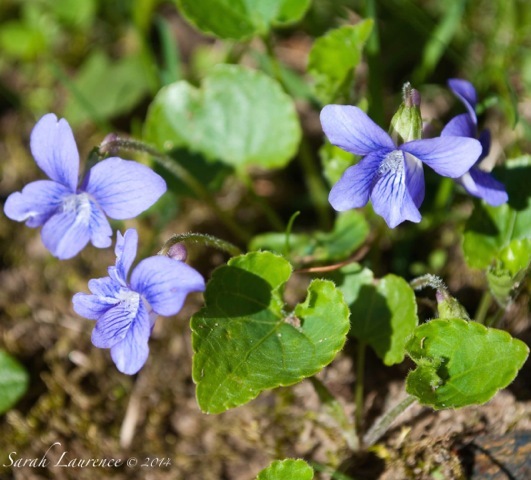 Let us hope that your Spring will be there to stay! Rhododendrons are tough. Wait and see. They will just be waiting in the wings! Scout has discovered something interesting. Yes, after such a long harsh winter, spring is especially welcome this year. Our magnolia trees didn't bloom nearly as nicely this year because of the long cold winter and spring. Bowdoin's look much better! Good to see that spring has finally arrived in Maine! 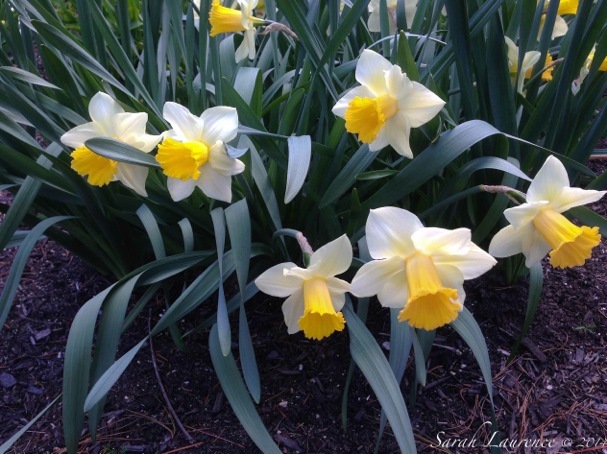 I love seeing the daffodils--mine have long since faded--and the magnolias are gorgeous. 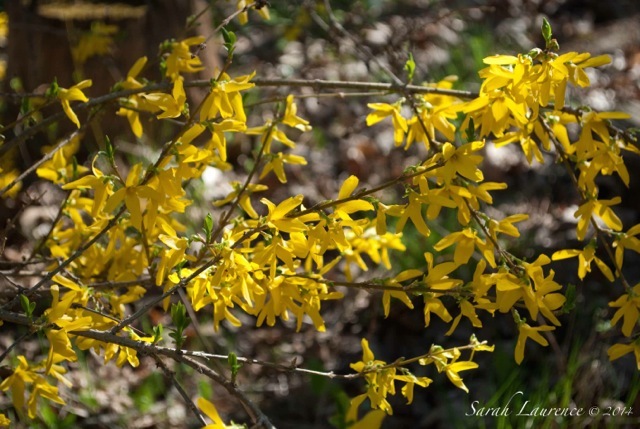 The winter was so hard on so many plants; a friend and I were commenting just the other day that we didn't notice any forsythia blooming this year--I think it got hit by the late frost and snow. Glad to hear that spring has finally come!! The pink magnolia photo is really amazing. It is so beautiful. I love the colors, particularly of the flowers and the blue sky with white clouds! It is fascinating to see how spring comes all at once where you live, as opposed to the gentle, drawn out way we live spring here in Wales. Daffs are floral sunshine - beautiful simile. I've never been to Nova Scotia but would love to travel there someday - I'll look forward to reading any travel tips your readers might provide. Yea!!!!!! Spring has sprung for you!!!! 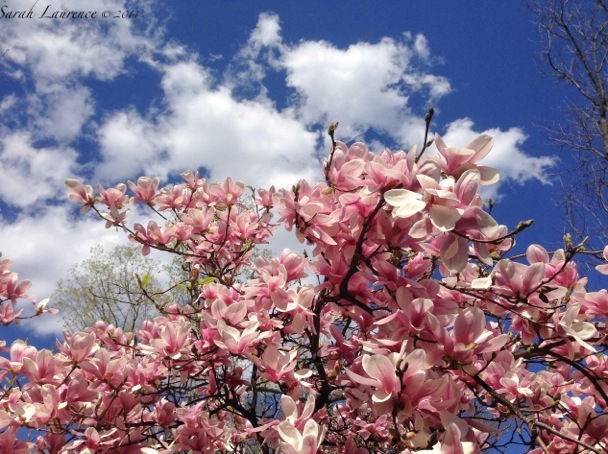 Beautiful shot of the magnolias. Look at Scout! How fast they grow…. 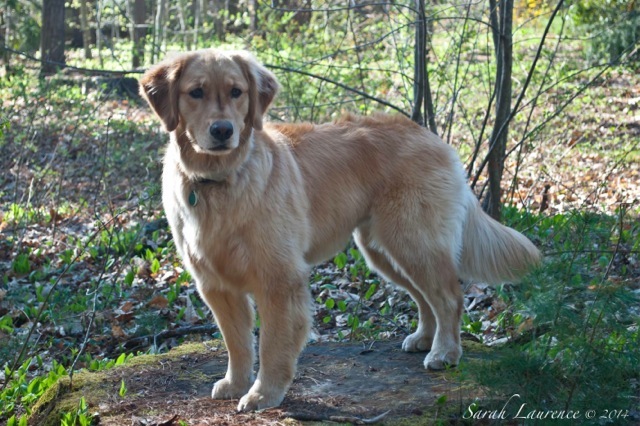 Cooper is 8 months and 75 pounds….. growing like a weed. Love the shot of your Golden!